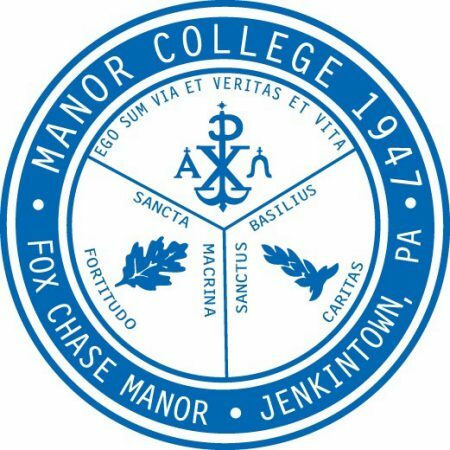 Manor College’s colors are blue and white, incorporated into the seal. The outer circle includes the college’s name, founding date and location. Top: The Greek symbol, Chi-Rho (representing Christ) is flanked by the Greek letters, Alpha and Omega (representing Christ as God who is beginning and end). Curving over the Chi-Rho are the words: “Ego sum via et veritas et vita” which mean: “I am the way, the truth and the life” John 14:6. Left: The Oak leaf represents courage, fortitude, and perseverance. Above the Oak leaf are the words “Sancta Macrina” meaning “Saint Macrina,” who was the sister of Saint Basil and the foundress of the Sisters of Saint Basil the Great. Below the Oak leaf is the word “Fortitudo” meaning “Fortitude” or strength. The Manor College Motto is “Fortitudo – Caritas” reflecting the virtues of Fortitude and Love which together reflect living life courageously and always mindful of keeping a blessed relationship with God. The seal is to be used for official purposes/documents only, not as a brand logo.